Joseph Paxton (1803-1865) head gardener at Chatsworth, writer, and garden designer. 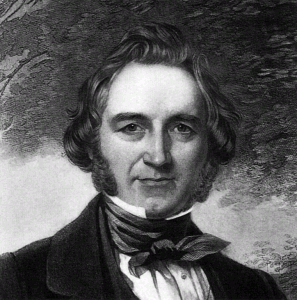 The history of English landscape design owes much to Joseph Paxton, the simple gardener who became the head gardener at the Duke of Devonshire’s estate Chatsworth, and one of the most famous horticulturists in England. Paxton designed Birkenhead Park, which Frederick Law Olmsted visited, and his greatest achievement, the Crystal Palace, the cast-iron and glass building erected in London’s Hyde Park, to house the Great Exhibition of 1851. His publication Magazine of Botany would see many years of circulation. But he was also famous in America, even though there is no record that he ever came here. Philadelphia nurseryman Thomas Meehan in his magazine Gardener’s Monthly wrote about Paxton’s death in 1865. He said: “Paxton, by his example and success, has been one of the best friends the working gardener ever had, elevating him and his profession to a point never before attained, and is entitled to the honor of a Saint in the Horticultural Calendar, and to be held in ‘everlasting remembrance’ “. The fact that Meehan mentioned Paxton in his magazine illustrates how important English gardening was to America. It was as if Paxton was one of our own. In a sense he was, since American nurserymen and seedsmen considered the English garden style the most important.